Every now and then I come across this problem. I see a product that looks cool. I ask the publisher if I can have a copy to consider for reviewing on this lovely website. They send said product, and it is just a wonderful as I anticipated. Then I am thoroughly unable to write a review. 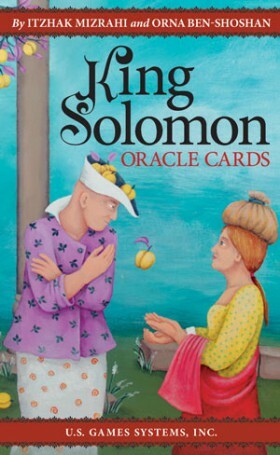 By now the “King Solomon Oracle Cards” by Itzhak Mizrahi and Orna Ben-Shoshan from U.S. Games Systems are pretty old news. I’m pretty sure I’ve been sitting on them for at least a month! So why no review? Sheer inability on my part. I like the art by Orna Ben-Shoshan. The coloring is vibrant, and yet the art conveys a soothing feel. I like the work of Itzhak Mizrahi. I appreciate how hard it is to come up with something new, and that the deck isn’t pretending to be a play on the traditional tarot deck. The “King Solomon Oracle Cards” are their own deck. A deck unto itself. Lastly, there are four amulet cards that also come with the deck. As per the included booklet, “These are your own personal sacred amulets that you may keep at home or carry with you wherever you go. 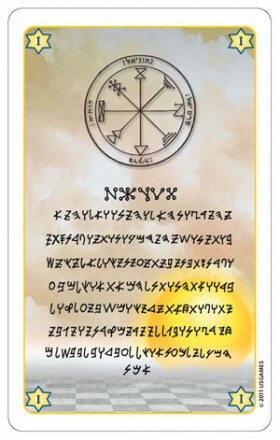 These charms were written in Angel’s Writing and ancient Goatic symbols by the kabbalist Itzhak Mizrahi.” There is nothing more impressive looking than an amulet. Seriously. I love the included amulet cards and have them on my bulletin board so I can take breaks to look at them when I write. That’s what I’ve got folks! After a month of handling the “King Solomon Oracle Cards”, a month of looking at the beautiful cards that I scanned into my computer for this review, a month of reading and rereading the over 40 page booklet included with the cards, I’ve got one paragraph to share. Perhaps after reading this micro review some of you will be inspired to seek out these cards, and hopefully you’ll be able to do a better job of articulating just how wonderful they are.